The SkyTrain can only take you so far, and only at certain times of the day. That’s why you need your own means of getting around in Surrey. Fortunately, if you don’t have great credit (or any credit at all) and need help buying a car, you can get financing through our car loan service. Complete your application in minutes. Qualify for a loan even with bad credit. Our car loans go as high as $40,000. Find the best auto loan rates in Surrey. Don’t pay a cent to apply or get approved. Will I qualify for a car loan in Surrey through your site? Most likely. Our requirements are pretty basic: you need to be a Canadian resident, 18 or older, fully licensed, and earning at least $1,500/month. Just fill out our online application with the details, click submit, and wait for approval. I just moved to Surrey from another country and I don’t have any credit history — will I still qualify for a car loan? Yes. It doesn’t matter if you’re new to the city — you just need to be a Canadian resident. And your lack of credit history is fine too. We work with drivers who don’t have credit almost every single day. In fact, it’s kind of our speciality. Do I need to drive for a minimum number of years before I can apply for a car loan? Nope. But you do need to be fully licensed, and in BC, that process takes about 3 years. Can I use my car loan at any car dealership in Surrey? No. Your car loan is only valid at one dealership — the one offering you the loan. Remember: we match you with a nearby dealership and then it’s the dealership that gives you a loan and sets the terms. Once your car loan details are settled, you can shop the dealership’s lot and find your new (or used) ride. How much tax will I have to pay on a vehicle purchased in Surrey? When you buy a vehicle from a registered Surrey dealership, you pay 5% GST and 7% PST — if your vehicle costs $55,000 or less. If the price tag exceeds that amount, the PST rate will increase. What’s a car loan term and how do I pick the right one? ‘Car loan term’ refers to the length of your car loan. In other words, the length of time (expressed in months or years) required to pay off your loan and interest charges. Car loan terms usually range from 24 to 96 months, but the right term for you will depend on your preferences and the state of your finances. Here’s a little guidance: short loans are great if you want to minimize your interest charges and are comfortable making bigger monthly payments; long loans are popular because the payments are smaller and more manageable month to month. 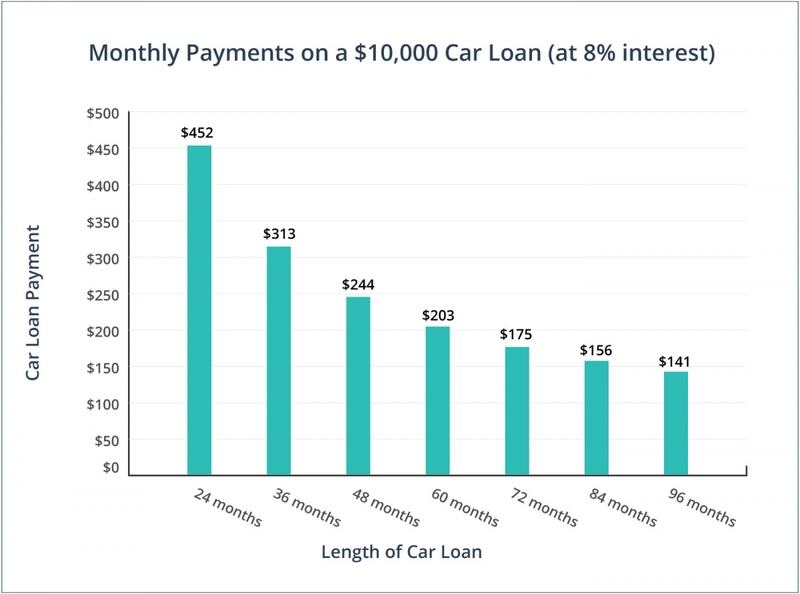 Just remember one other thing: long loans translate into a greater number of monthly interest charges, which makes your car loan more expensive in the end. Here’s a look at how your payments may increase or decrease depending on the length of your car loan. Hopefully this helps you choose the right term. Think less interest charges and a quicker way out of car loan debt. Short car loans (eg. 24 or 36 months) are often worth the higher monthly payments they bring. We know you’re keen to get on the road, but you should always have your vehicle inspected by a qualified, trustworthy mechanic or a BCAA expert before you buy it. A used car may not last very long. Or you may want to replace your new car with an even newer model 3 years from now. In either case, you don’t want to be stuck paying for an auto loan on a car you don’t drive anymore. Think about these scenarios as you pick your car loan term. At all Surrey dealerships, the sticker price (or the advertised price) should include the cost of the car plus all applicable fees (dealer fees, inspection charges, etc.). You should always double-check and ask the salesperson questions before you move forward with the purchase. I won’t be able to afford the interest charges on a bad credit car loan. False. Bad credit car loans will have higher interest rates than standard car loans do, but the rates will be market competitive if you procure your loan through LowestRates.ca. Our dealers will serve you to the best of their ability — they have a lot of experience working with drivers who have bad credit. I can’t get a car loan if my last vehicle was recently repossessed. False. That may be the case if you’re dealing with the big banks or with a credit union, but not with us. We can still help you get a car loan and we’re happy to do so. And the dealer we match you with will try to accommodate your situation as much as possible. Of course, you’ll have to do your part too and make your monthly payments on time. Surrey’s used car dealers don’t have to make mandatory disclosures. False. All registered dealerships in BC have to provide the same mandatory disclosures. And getting that info is especially important if you’re buying a used vehicle. Consult the Vehicle Sales Authority of British Columbia (VSA) to see which disclosures dealers have to make. I can use my new auto loan to refinance my current car. False. The car loans you get through our service are only for vehicle purchases. Plus, you must use the loan to buy a car from the dealership offering you financing. Unfortunately, our car loan service isn’t the right fit if you’re looking to refinance. Feel free to come back when you are ready to buy. Surrey drivers get a second chance. If you’ve experienced a financial setback, like a bankruptcy or divorce, you can still qualify for an auto loan through our site. Under Canada’s Competition Act, auto dealerships cannot sell vehicles at prices higher than the lowest publicly advertised price — even if the driver didn’t know about the lower price. The Vehicle Sales Authority of British Columbia regulates Surrey car dealerships and even runs investigations to keep them in check. So if you’re worried about something like odometer tampering, contact the VSA. Canadians are pretty reliant on cars. In fact, approximately 74% of Canadian commuters drive to work every day.